I know of no Canadian translation of the Nights. Canadian published editions are few and far between. It is the UK and the US who produce almost all of the English versions of the Nights. The earliest Nights edition I can find, bearing a Canadian imprint, is that of James Campbell & Son, Toronto, 1867. Indeed, the Campbell Nights is a reprint of a later Nimmo edition. 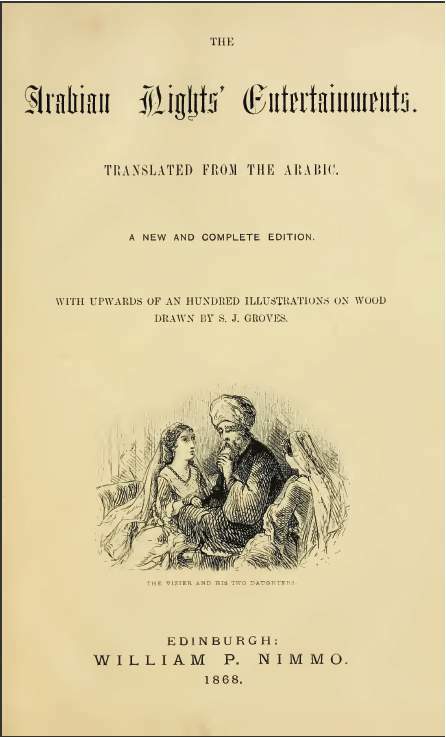 The original Nimmo edition was published in 1865 in two volumes, totalling 1084 pages. Nimmo reissued its version of the Nights, scaled down to 540 pages in 1867. This is the version that Campbell issued. Both the Nimmo and the Campbell versions lack any table of contents, have the same page numbers and lay-outs. The Campbell edition is exactly the same as the Nimmo edition. The only change in the Campbell version is the change of the publisher on the title page. Everything else remains the same, including the “Ballantyne and Company, Printers, Edinburgh” credit. It may well be that the two versions were printed at the same time, by the same printer. The University of Western Ontario holds a copy of the James Campbell Nights. This is the only print copy I can find. From this copy the Canadian Institute for Historical Microreproductions (CIHM) made a microfiche copy, No. 12624. Memorial University of Newfoundland has a copy. Fortunately for posterity, the CIHM collection parameters are very broad. 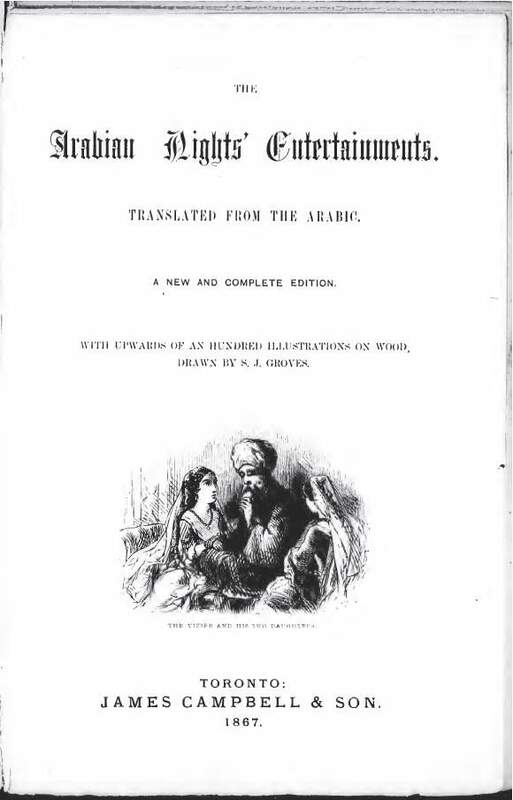 The Campbell Arabian Nights makes it into the collection because it bears a Canadian imprint. That is pretty much the only Canadian thing about it. I have my doubts about even the paper and ink being Canadian. This entry was posted in Arabian Nights. Bookmark the permalink.